November 22, 2017 Geren W. Mortensen, Jr.
On November 10, 2017, I did the almost unthinkable, and switched from an Apple iPhone 6s to a Google Pixel 2. There were a number of reasons behind the decision, but chief among them was the superior quality of the Pixel 2's camera. Most of the other functions are pretty much like any modern phone -- it makes and receives calls and texts, and you can surf the web and waste time on Facebook. I chose to go with the "standard" size, with 128GB of on-board storage, as I keep a lot of music and photo files on my phone most of the time, and I've added a Zagg screen protector and the new Moment Pixel 2 case and their new Tele lens (so far). The camera really is amazingly good, especially given how physically tiny the thing is. The detail, noise, and color are all excellent, and the images hold up quite well to editing in my favorite mobile app, Snapseed (available for both Android and iOS), and the mobile version of Lightroom CC. Although I haven't used the feature, it's even capable of shooting raw files. 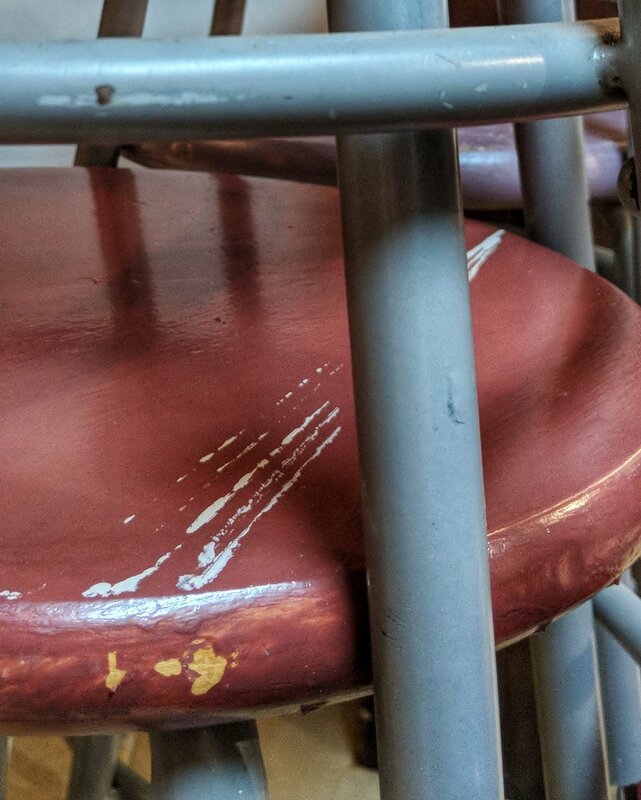 Stools detail, Pixel 2 camera Auto HDR+, cropping and slight adjustments in Google Photos. The pictures I've taken so far have been JPEGs with the standard camera, and without the Moment Tele lens. I have played around with a few of the special features -- notably the Auto HDR+ and Portrait modes. Auto HDR+ yields very good results most of the time. There's lots of detail in the shadows without much noise, and the overall effect is quite natural. The Portrait mode generally does a nice job of rendering fake "bokeh" (defocused backgrounds) around the subject, although it is possible to fool the AI, with some odd results. I'll write more about that another day. I've added a new gallery, also called Pixel2ated, for images made with the Pixel 2 (go figure), that you can visit to see my new exploits in mobile photography. My only complaint about the Pixel 2 is that there's no headphone jack. Most of the time, this isn't really a problem -- I can connect to one of my cars' radios via Bluetooth, and there's a USB-C to audio adapter that comes in the box. Unfortunately, the adapter doesn't allow for powering the phone while it's plugged in, which can be problematic on long trips if I want to use Google Maps for navigation and listen to Spotify or a podcast. On my daily commute, which takes about an hour-and-a-half, I can easily eat up 15-20% of my battery. The Pixel 2 also doesn't have iMessage or Facetime. The built-in text app is pretty basic and struggles with group MMS messages, so I've been fooling around with alternatives (so far, QKSMS is my favorite). For a Facetime replacement, I found Google's Duo, which is free and cross-platform, and seems to work just as well as Facetime. I think Facebook Messenger has a similar function. And, of course, there's also Skype, which works on anything. The bottom line, after about a dozen days, is that I don't really miss anything about the iPhone. A big part of that is because of how clean Android is on the Pixel, I'm sure. It runs smoothly, and pretty much everything just works, which I could no longer say about a number of functions in the iOS world.